Every Tuesday, Jack Rose will host “High Top Drams” — a complimentary whisk(e)y tasting at the Saloon Bar’s high top tables. Whiskeys will include several unique expressions selected by the bar’s expert staff and will change weekly. Inviting beer lovers to cap off “Humpday” by enjoying free beer tastes from Beer Director Nahem Simon’s favorite breweries. Hosted in Jack Rose’s second floor Balcony Room, guests can overlook 18th Street in the sunny, glass-enclosed and air-conditioned bar during “Humptastic Brews with a View.” Beers will change weekly. 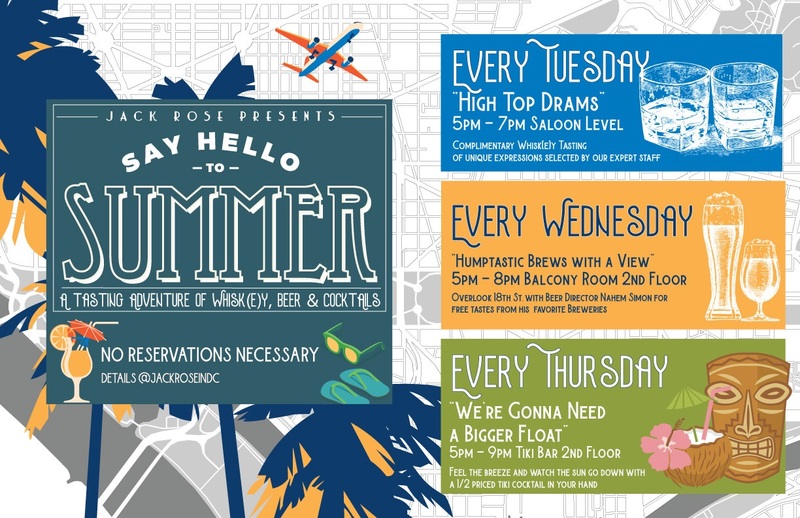 For Washingtonians who can’t get away to the tropics this summer, Jack Rose is bringing the tropics to DC. Guests can feel the breeze and watch the sun go down with a half-priced tiki cocktail in hand. Evoking vibes of pool floaties and boozy rum floats, offering eight original and classic-inspired Tiki cocktails at only $6.50. The Tiki Bar also offers island-inspired beers and luxe sipping rums.